Would you say that the current pope is a mainstream orthodox Catholic or a traditionalist? I'm not goign to label the pope or try to figure out where he lays...he would of course say that he is both, and in fact we have to think differently when discussing the pope himself since he is often the reference point for what is considered mainstream and/or orthodox. For example, under JPII it could be argued that those who favored the loosening of restrictions on the TLM were a traditionalist minority. Since BXVI has made this a reality, those who still feel this way are now more mainstream. We gotta be careful about trying to place the pope. I'll go ahead and say it, though. I think that "orthodox conservative" label fits the pope way better than the "traditionalist" label. I know you don't care about it, but here in Argentina the NO is getting worst every day. The bishops don't hear the Vatican. It's seems they laugh about pope's directives. IMO, "orthodox conservative" is much more fitting. 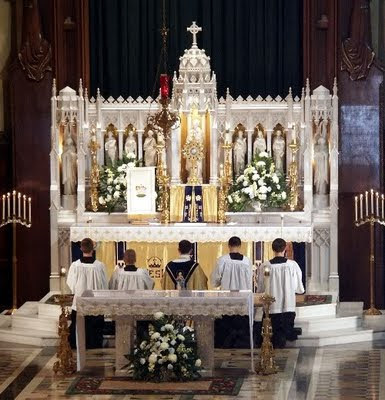 Communion within and throughout the Body of Christ is front and center in importance for Benedict, so it only logically follows that he will utilize tradition as a means to that end, and rightly so. Tradition is what brings families together, and the Church is no different. To exclude modernity or traditionalism completely would alienate many of our brothers and sisters. Truth in love, love in truth. He's doing very well so far, imo. I appreciate your thoughts on the NO. Great post.